Where Did the Outlook Plugin for IBM Connections Go? UPDATE! Last week a friend of mine asked me if I could try and find out where the IBM Connections plugin for Microsoft Outlook had gone. It was no longer available as a download in the IBM Collaboration Solutions Catalog. Turns out it has been pulled! A real life story that happened to me with two different customers. Once upon a time there two files. Each file was used in a different organisation. The files were important for the organisations and several people needed access to them as several departments and projects needed to be able access, update and read them. In the first organisation the file was created by a team manager who then uploaded it into a team room in Microsoft Teams. Everybody with access to the team room could now reach the file and work on it. However, they didn’t have version control, nor could they really set different permissions for different users of the team room. Furthermore, other teams also wanted access to this file. But as long as they weren’t members of that particular team, they couldn’t reach the file. The solution was to upload a copy of each file to the other team rooms in Microsoft Teams. Each team got a different copy. The problem with that solution was everybody was now working on different files. This created a lot of confusion. Finally they had to sit down and try to merge all the copies into one file, which took a hell of a lot of manual work. When the file was to everybody’s liking, they now uploaded it into Sharepoint. They could now add this Sharepoint file to several team rooms in Teams. They could also set permissions so that some teams could write to the file, while others could only read the file. But they could only set the permissions for the team room as a whole. They also had version control now. However, the team members had a hard time understanding why the file wasn’t in their Teams files. They had to remember to go to the Sharepoint tab in Teams to get to the file. If they wanted to see the file revision and version control, or wanted to see who had done what to the file, they had to open the Sharepoint app. It was a lot of unnecessary work that made a lot of users rather grumpy and confused. They also wanted to share the file outside of their organisation with a couple of business partners. This could be achieved via a guest account, but this wasn’t something they wanted to do. Instead they discovered that they could share the file externally via the Offie 365 apps, but only if you changed several permissions in the Sharepoint admin tool first. It was a lot of work and they ended up emailing the files to the external users. They then uploaded the edited file they got in return into Sharepoint, with all the pitfalls that came with such an approach. What they did love though was the ability to let several people edit a document at the same time in their web browser. This worked beautifully, and they could have an online meeting where everybody was working on the same file, seeing the updates being made live. After saving, all the formatting in Office file was intact. It was also very easy to access the file via Windows Explorer and to open it up in Office to work with it locally on their computer. 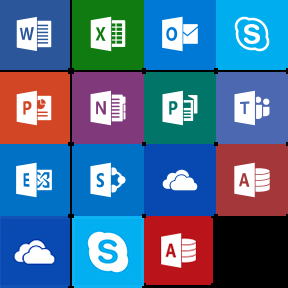 But as the number of Teams grew and people started using more and more of the many apps inside Office 365, it became more and more difficult to have the overview the workers needed to keep up to date. There was no singular newsfeed to keep people updated. 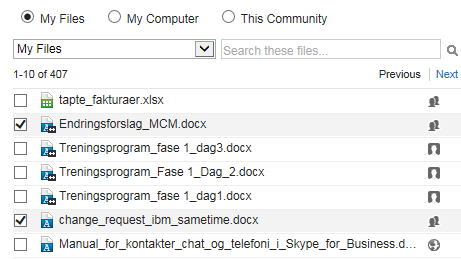 In the second organisation the file was created by a team manager who then uploaded the file to his own profile in IBM Connections. He then shared the file with his team via the community the team had in IBM Connections. Now all the members of this community could both work with and read the file. They also had full version control and they could also set different permissions for different community members. Other teams also wanted access to this file. This was no problem. Since the original team leader had uploaded the file to his own profile, he could just share the file with any other community or other users directly. Everybody was now working with the same file without any hazzle. And even though the file really resided in the original team leaders profile, each community saw the file in the Files view of their community, as if the file was there. There was no need to look for other apps or tabs inside the community. To see who had done what to the file, and to have revision and version control, all they had to do was to to go to the file inside their community. All the details were there. They also wanted to share the file outside of their organisation with a couple of business partners. This could be achieved via a guest account, but this wasn’t something they wanted to do. And since they didn’t want t to do that, there wasn’t much they could do, without buying a third party app like Box or similar. This was a major grievance for the organisation. What they also wanted was to be able to let several people edit a document at the same time in their web browser. To be able to to this they had to buy IBM Docs as it doesn’t come out of the box in Connections. But they soon discovered that IBM Docs screwed up the formatting in the Office files, especially in Excel and Powerpoint. For Word documents, they got by. However, it was very easy to access the file via Windows Explorer and to open it up in Office to work with it locally on their computer, something they were very happy with. What the IBM customers also was very happy with was that no matter how many communities or how much functionality they used, everything was contained within the same user interface, the same program and the same newsfeed. You didn’t need to think about when to use what functions, everything was inside IBM Connections. Microsoft’s Office 365 has great functionality when it comes to document editing and creating good and useful Office files. It’s also good for smaller collaboration teams. However, there are way too man apps and way too many possibilities, and despite this, it’s still very difficult to share information and files between these apps. Heck, it’s even hard to share information and files between different teams within the same application. For a large organisation, I would definitely think long and hard before I started using a lot of these apps, especially Teams. A Sharepoint site is better, but then you will have a lot of development costs in addition to the license. Unless you find a good Sharepoint template to use. Bot solutions have the ability to create guest accounts so that you can invite external users. But where Connections can’t share files outside the organisation out of the box, Office 365 actually can. Both solutions makes it seamless to work with files directly from your local PC and from your email. So both have their strengths and weaknesses, but I find Connections to have the upper hand when it comes to social collaboration and it has a lower learning curve when it comes to working effectively with it as a collaborative tool across the silos of your organisation. Office 365 still encourages silos. However, if all you want to do is work with files and not much else, Office 365 is the way to go. And: You can actually work with Office 365 files from Connections. Something you cannot do the other way around. Any thoughts, questions or comments? Use the comment fields below! Woke up half past five in the morning. My internal clock is still not up to snuff. The humidity outside was unbelievable and there was so much fog that I opted for a 4 x 4 interval run on the thread mill instead of running around the lake. After hitting the shower and taking in some breakfast it was off to the conference. On the way there I realised I had forgotten my conference badge and I had to run back to get it. After running to the conference hotel I was so soaked in sweat that I didn’t know what to do, but thankfully Floridian style air condition quickly cooled me down during the first session. As I’ve stated many times, I love the IBM Connections plugins for IBM Notes, Windows Explorer and Microsoft Office. I therefore try to pick up so many tips as I can about them. I really didn’t learn anything new during this session, but I was able to give a few inputs, tips and pointers to people. Two people from the plugins’ developers team told me later in the day they really appreciated my feedback and promotion of the plugins. Made my day! For the four past years I’ve been working hard on introducing IBM Connections in my organisation. It has hit quite a few roadblocks during the way, so it’s always nice to listen to other the experiences of other IBM customers. Lufthansa are using IBM Connections through their entire organisation, and it was very interesting to hear about their challenges. I also liked that even though they had switched from Jive to IBM Connections, they didn’t down talk Jive. They said it had delivered what they wanted, but now they wanted more. That’s class. When a huge and important company like Lufthansa choose IBM Connections I think IBM should do even more to make Lufthansa representatives travel around talking about it! 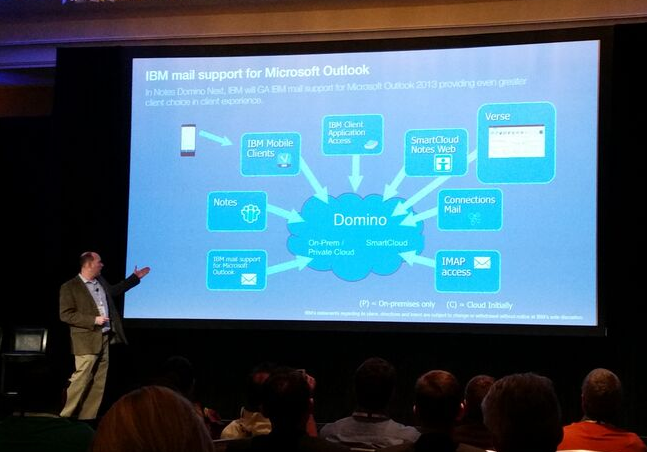 As usual a session about the future of IBM Notes and Domino was a session that was packed with people. You can take Lotusphere out the Connect, but you can’t Lotusphere out of the attendee. Java (JVM) will finally be updated to the latest version! You can now delegate calendar and To Do entries! It will be on premise during the second half of 2016! Phew! To sum up: Domino is not going away. It seems that there still will be an IBM Notes client, but we are getting mixed signals about that, especially because of the ICAA, which is replacing the Notes Browser Plugin. But IBM are committed to Domino, and now that you can choose between five different clients, including Outlook, there is absolutely no need to spend millions on migration yet! So tell your boss and Financial Director that, ok? Tufts Health Plan found that after deploying IBM Connections, users just didn’t take to it. After getting XCC involved they developed a social intranet where IBM Connections is hidden under a layer of widgets and apps. Instead of confusing their users with terms as wikis, blogs and so on, they instead offered the user a new GUI, where widgets and apps presented contents from IBM Connections in the form of news streams and forum postings, just as you would expect to see on any normal web page used for collaboration. It seems that a lot of companies do this with IBM Connections and the users take to Connections much easier this way. People don’t even think about it as Connections, they just use the tool and engage in collaboration. I will check out XCC and their tools a bit more. It was a really inspirational presentation, and it gave me a lot of ideas. In my company we have been adapting to the use of IBM Connections for the last four years. That’s also the situation for the Spanish company Hipra. They told their story on how the adoption in their organisation has been. It seems like they have gone into the same pitfalls as we did, but little by little, they increased participation from their users. It’s always nice to share experiences with other companies in the same situation as yourself, and that’s one of the reasons conferences like these are so useful. The plugin parts of this presentation was just a repeat of what I’ve seen already this week (and already knew). It was exciting though to see how incredibly useful it is to be able to edit Microsoft Office documents directly in the browser via IBM Docs. This means that you can edit the document without having to download it first. You can also do @-mentions inside the documents, and when the user that is @-mentioned clicks on the link, she is taken directly into the place in the document where she was tagged! Files in IBM Connections is an incredibly strong product that you all should start using. Stop saving documents on network drives or on your computer. And if you also invest in IBM Docs, you can even edit the documents in the web browser, or on your mobile device! 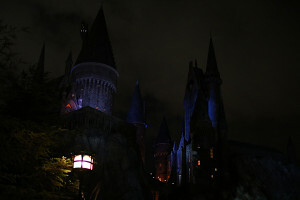 It was then time for some blogging before we took the bus to Universal Studios and Harry Potter Land. 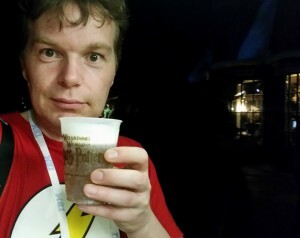 IBM rented the whole area for us, and the Hogwarts ride with the brooms is awesome! 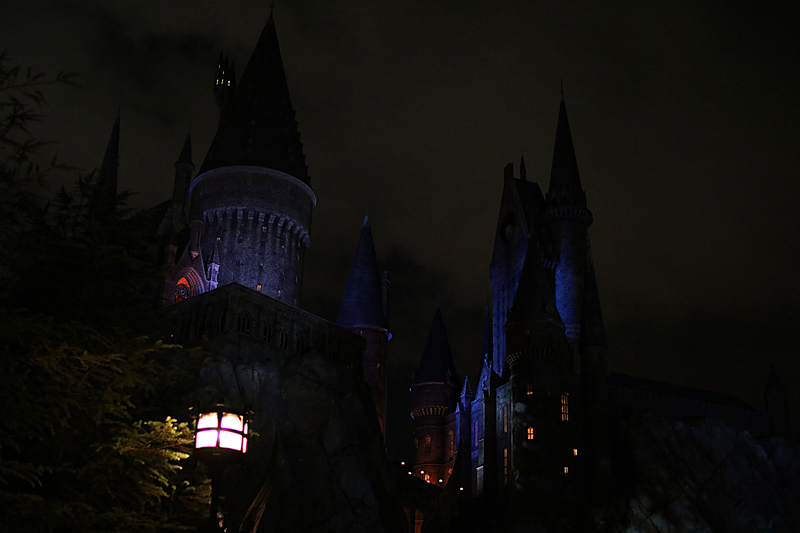 I must say that it was also really cool to experience Hogsmeade and Diagon Alley in the dark. When I visited last year, it was in broad daylight. After the park I was so tired I just had to get home and crashed into bed. I had to prepare to start the day with Mat Newman the next morning. You need your strength for that! Adding a file to an activity can a lot of times be very useful. However, if you just simply upload the file into an element in the activity, you have no way to upload a new version of that file. This means that you have to download the file locally, edit it, and then upload it again into the activity. You then have to delete the previous version of the file from the activity, because there will now be two files. There is, of course, a much better way to do this. You can share your own files with the activity. This means that every time you update that file, the activity will link to the newest version of the file, and you don’t have to worry about old versions. When you have selected the files you want, click on Insert Links. You can remove any file by clicking on the x to the right of the file name. When you are finished with your editing click on Save. 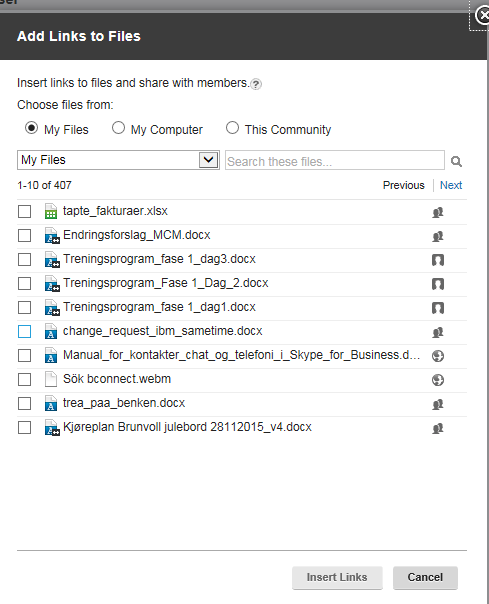 All members of the activity can now click on a file link to open a file. Remember: This is just a link to one of your files. The members of the activity can’t edit the file and then upload it to the activity as a new version. Only you, and people you have shared the file with and given editor rights to, can upload new versions . But when a new version is uploaded, the link in the activity will lead directly to that version. You do not need to add the link again. This is a much better way to deal with files in Activities. Please let me know in the comments section what you think of this tip, or if you have any suggestions, corrections or other feedback.